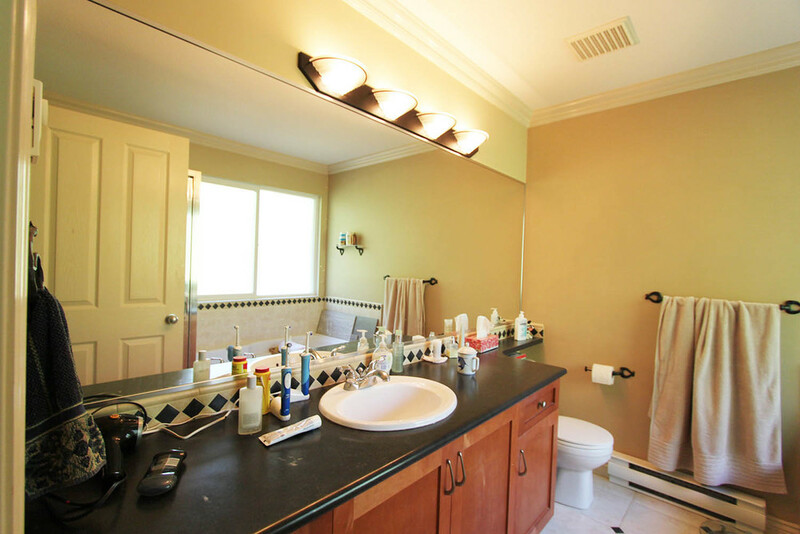 A cramped, standard, and uninspiring everyday bathroom transformed into a home spa for two marrying high-end luxury and functionality. 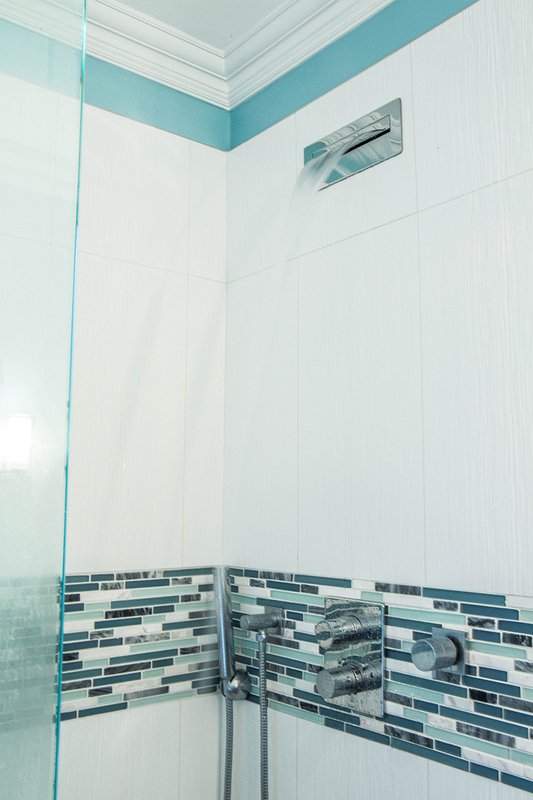 Water-loving clients can enjoy a shower boasting three ways to experience water, with handheld and flush-mounted rainfall and waterfall shower heads, or the attention-getting, stand-alone soaker tub that oozes flair. Lighting diversity includes pot lights, wall sconces, and under-the-vanity lighting; dimmer switches help create the perfect ambience. 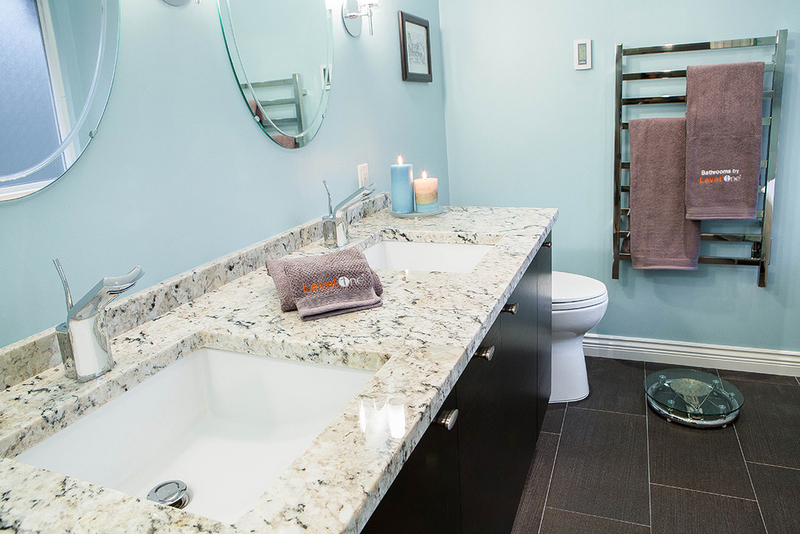 Eco-friendly features: low-flush toilet, in-floor heating, towel warmer, programmable thermostats. 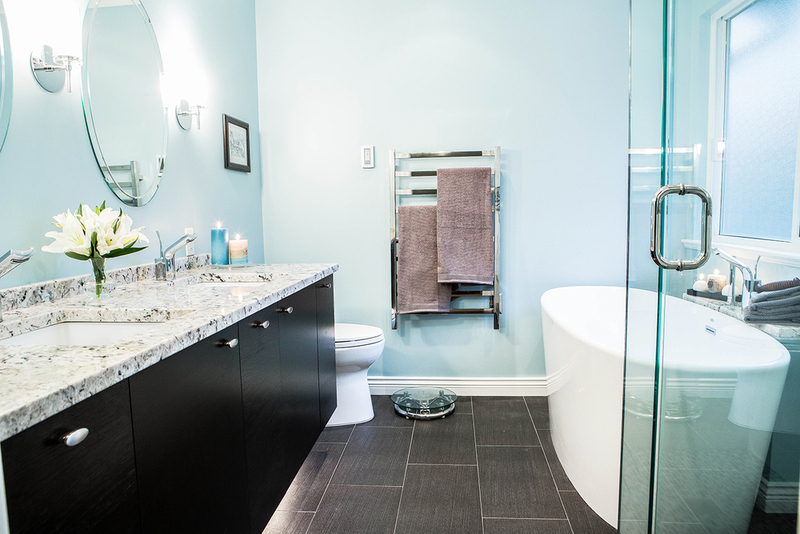 A smart use of shape, replacing the space-consuming tub deck with an oval, freestanding tub, allows for a larger shower and ample room for the stylish bathtub. 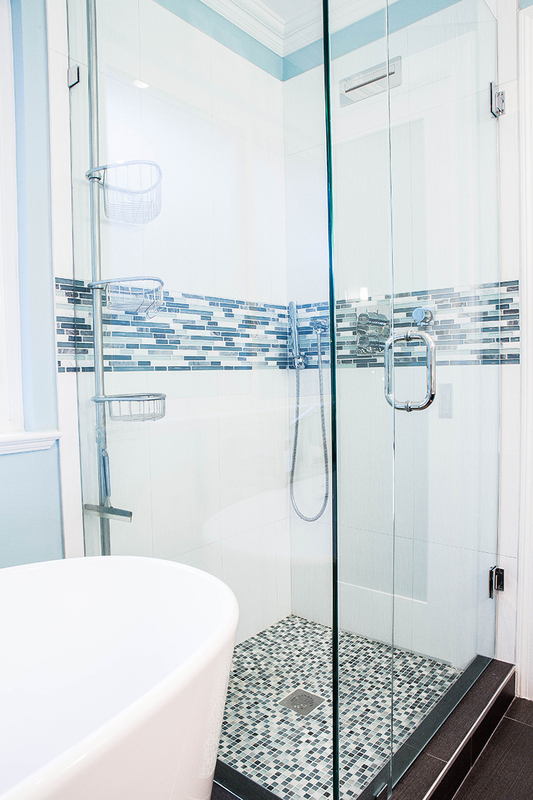 The shower area was expanded by removing the prefabricated pan and replacing with a custom-built pan and glass, beautifully enhanced with mosaic tiles. The sleek, 500-pound, bathtub reflects the luxury feel the clients were seeking. 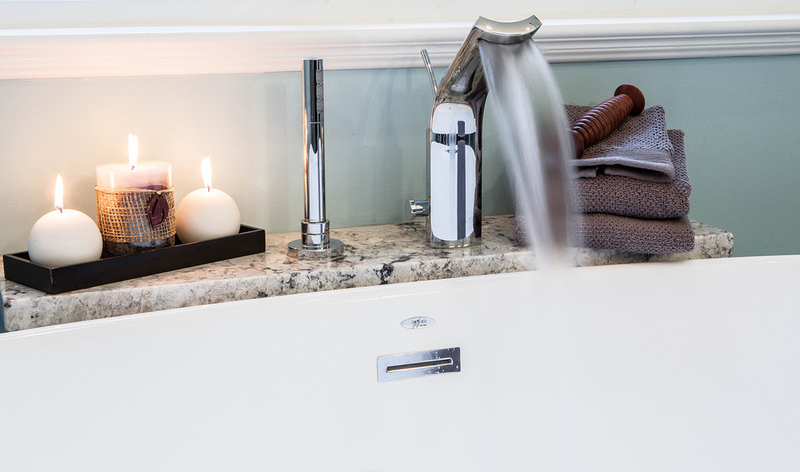 A pony wall was built, hiding plumbing and accommodating faucets, and finished with matching marble which doubles as added shelving for bath accessories — or a wine tumbler! 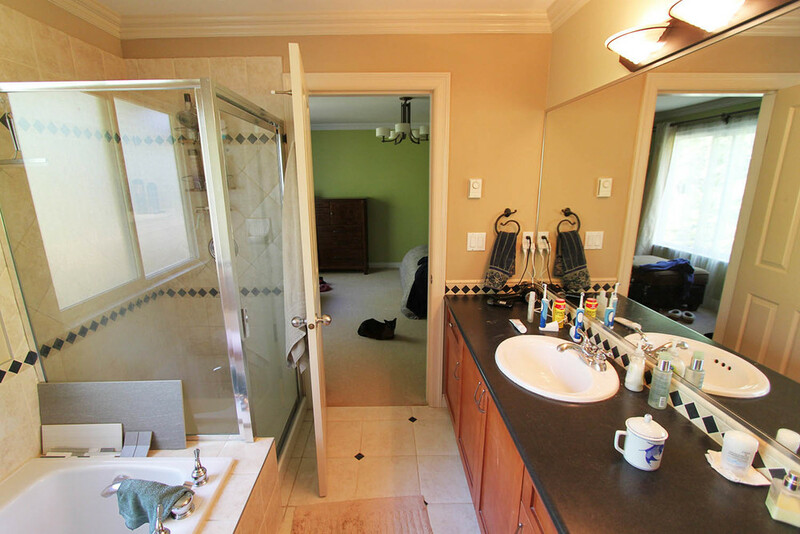 Plumbing was completely overhauled to correct for existing errors while meeting the project’s needs. 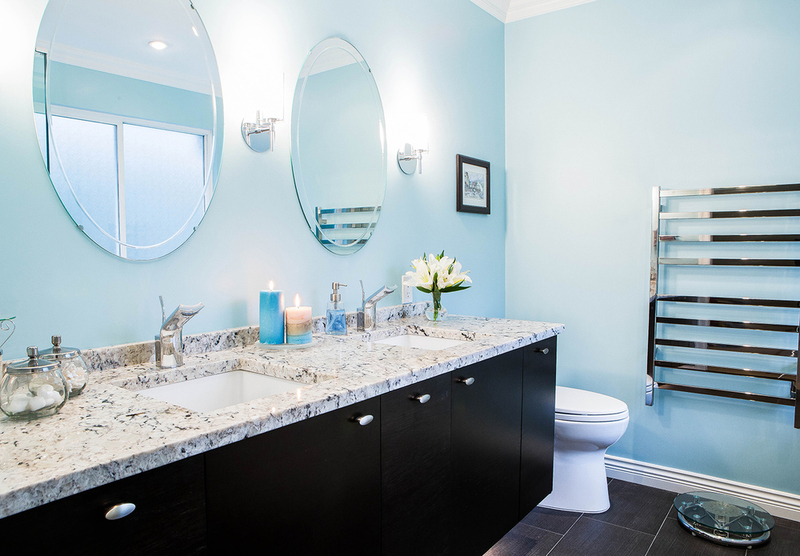 Customized, off-the-shelf cabinetry used for the vanity allowed cost savings to be redirected to high-end fixtures. 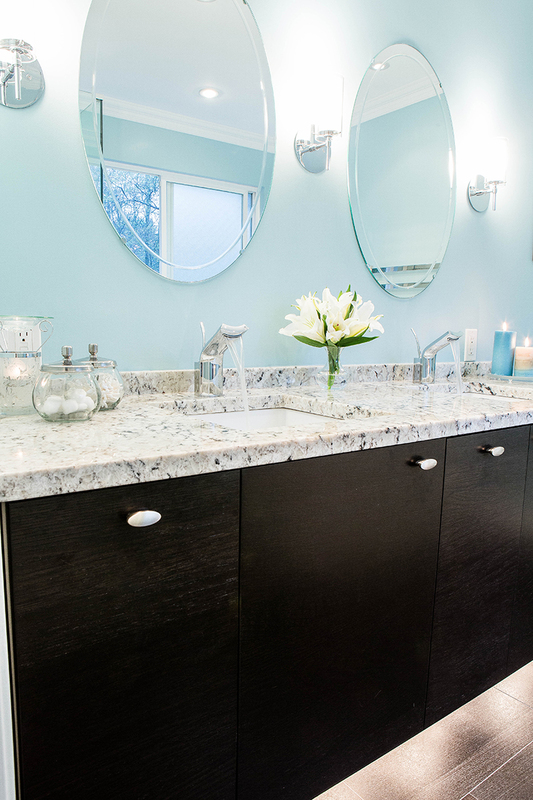 Despite the footprint’s constraints, the floor plan was maximized so two can comfortably share the space, with his/hers sinks under-mounted to a custom marble slab with greatly extended vanity. 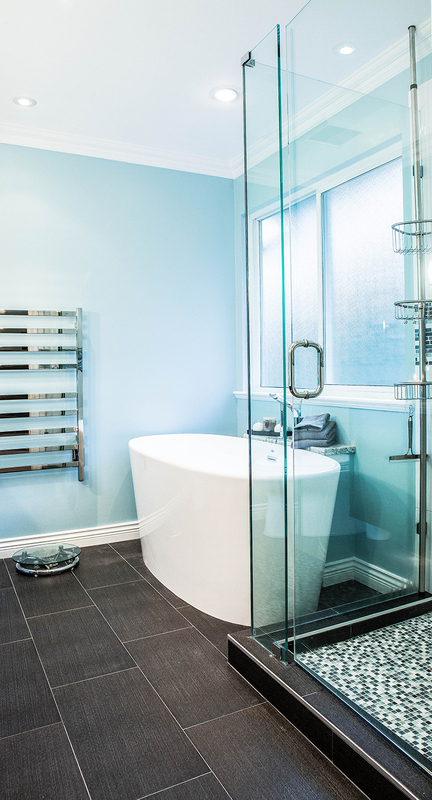 Unsightly, space-consuming baseboard heaters were eliminated in favor of energy-efficient, programmable in-floor heating, better accommodating the showcase bathtub, while the wall-mounted towel warmer adds to the minimalist look.